Goondiwindi Argus has been serving the community for many years, and remains the primary source of news for the local area. It is published each Wednesday, and the locals still usually wait out of the front of the office for their paper. The Argus also has a strong online presence and is a trusted site for breaking news. 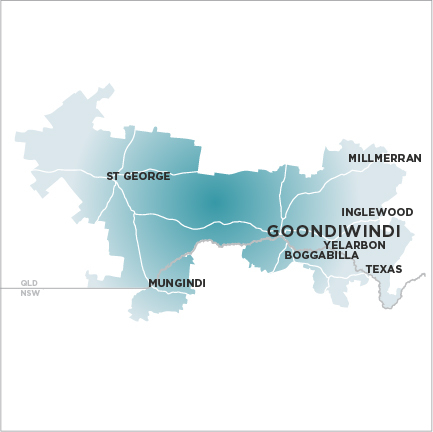 Goondiwindi is located on the Queensland/NSW border, and sits at the junction of six major highways, the Cunningham, Newell, Bruxner, Barwon, Leichhardt and Gore. It is a modern and vibrant community, while retaining the simplicity and charm of a traditional rural town. Agricultural production is the mainstay of the local economy. The fertile, heavy clay soils of the river valleys ensure a strong demand for farming and grazing land. Cotton is the major industry, along with substantial quantities of oats, barley, sorghum, chickpeas and soybeans.